Kedushat Levi, Chassidic essays, by R. Levi Yitzchak of Berditchev. Zhovkva, 1806. Second edition printed in the author's lifetime, with the approbation of the author R. Levi Yitzchak of Berditchev to this edition, and with the approbation by R. Yaakov Orenstein Rabbi of Lviv, author of Yeshuot Yaakov. The book includes Kedushot – essays relating to Chanukah and Purim, the Klalot HaNissim essay, commentaries to Aggadot concerning the Elders of Athens, and Talmudic novellae by the author's father and sons. 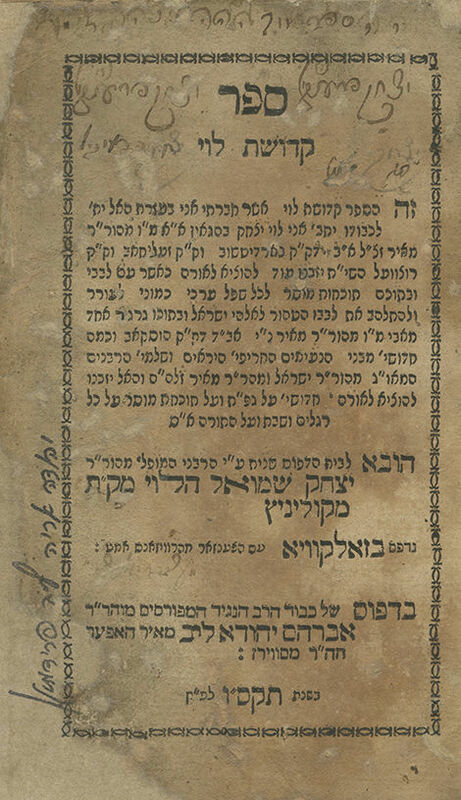 In this edition, the essays were printed in the same format as in the first edition of Kedushat Levi (Slavita, 1798), with the addition of approbations by the author and the Yeshuot Yaakov, as well as the publisher's foreword, in which he relates that the author R. Levi Yitzchak asked him to publish this edition, since the books of the first edition were out of print. This edition was printed within the mourning year following the passing of the author's son, R. Meir of Berditchev, author of Keter Torah, who passed away on 29th Tishrei 1806. In light of this, several minor changes were made to this edition, such as the addition of "zal" after the name of R. Meir on the title page and p. 37a (of the first pagination). Another change to this edition, performed by the censor, is the omission of the last few lines of the book pertaining to conversion. The first edition of this part of Kedushat Levi was brought to print by R. Levi Yitzchak himself. The book is named after the Kedushot essays pertaining to Chanukah and Purim, which comprise the main part of the book. The first edition, as well as this second edition, were printed in this format. Approximately a year after the passing of R. Levi Yitzchak, his sons and grandsons published a further edition of the book, with the addition of novellae on the Parashiot of the Torah, based on writings the author left behind (Berdychiv, 1810). The book has since been reprinted many times in its expanded format. A third part of the book appeared in a later period, on Pirkei Avot, based on writings found in the estate of the Maggid of Koznitz (Kozienice). This book was reputedly written by R. Levi Yitzchak himself, unlike other early Chassidic works which were recorded by the disciples of the authors. The Minchat Elazar of Munkacs would exert himself and read this book protractedly, maintaining that Kedushat Levi contained almost all the writings of the Arizal allusively, each word being built on foundations of Kabbalah and requiring deliberate, in-depth study to understand all the profound teachings concealed in it. (According to Breslov tradition, some of the Kedushot on Chanukah and Purim in this work were written by R. Natan of Nemirov, the famous disciple of R. Nachman of Breslov, while he was studying under R. Levi Yitzchak). Great Torah scholars attested that Kedushat Levi bears the remarkable power of endowing its reader with enthusiasm and devotion in love and fear of G-d, also maintaining that just keeping the book in the house has the capacity to mitigate decrees and protect from destructive forces, as Rebbe Avraham Yehoshua Heschel – the Apter Rav wrote (in his approbation to the Berdychiv, 1815 edition), as well as R. Aharon of Zhitomir in his approbation to that same edition, and the rabbis of Munkacs (in their approbation to the Munkacs 1939 edition). Signatures on the title page: "Yitzchak Fränkel".
. 44; 32 leaves. 18 cm. Condition varies. Most leaves in good-fair condition. Stains and wear. Worming. Minor dampstains. Dark stains, worming and tears (repaired) to title page. Worming to second leaf, repaired. Damage and minor tears to several pages, not affecting text, repaired. Marginal paper repairs to some of the final leaves. Several leaves may have been supplied from a different copy. Stamps. New leather binding.